Contest: Win A Priceless $1,000 Shopping Spree Giveaway! Win A Priceless $1,000 Shopping Spree Giveaway! 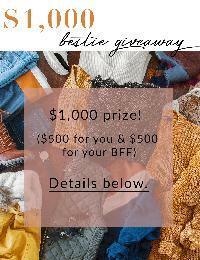 Prize: 1 Lucky Winner will get a $500 store credit and $500 credit for their friends they referred. Statistics: This contest was opened by 199 and entered by 18 ContestChest.com members. 9% of those who opened the contest, entered it.